​The 6th Form has a dynamic and focused Student Leadership Team. Near the end of the academic Year, Year 12 students are invited to apply for student leadership roles within the main school house system. 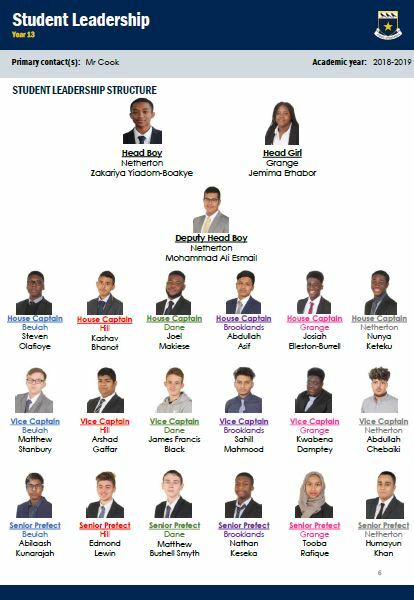 The student leadership structure is comprised of a Head Boy, a Head Girl, a Deputy Head Student, then a House Captain, Vice House Captain and a Senior Prefect for each of the six houses. Students fill out an application and then go through an intensive interview process for each of these roles. The current Leadership structure for the academic year 2018-2019 is shown below. 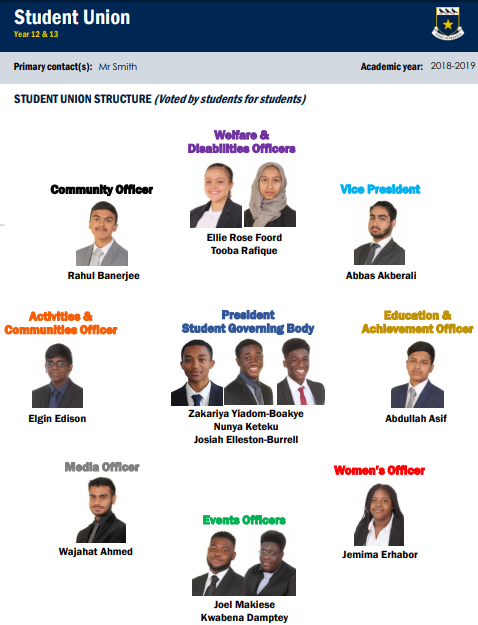 Other leadership roles within the Sixth Form include peer mentoring of younger students, volunteer work within the Students for Learning Homework group, and the organisation and running of the Sixth Form Union and its affiliated clubs (Student Union structure also shown below). Consequently, student leadership becomes an integral part of the Sixth Form experience and provides students with valuable skills for University / Apprenticeship applications and the world of work.